Bull snake, pine snake and gopher snake are different names for a single species (Pituophis melanoleucus or Pituophis catenifer). In the western United States, the species is frequently called the gopher snake; in eastern states, bull snake is more common. The nonvenomous snake helps control the rodent population in many areas. Farmers in states like South Dakota find the snake most helpful in preventing crop destruction by small mammals such as gophers. The bull or gopher snake’s body is mostly yellow or tan. The top of the body is covered with around 40 reddish or brown triangular spots or blotches on his back. This is why often he is often mistaken as a venomous rattlesnake. However, the bull snake has a long, limber body, and rattlesnake is stockier with more bulk. The underside of the snake is generally yellow and has large black spots that reach out toward the sides. The bull snake is one of the largest snakes in America, traditionally reaching up to 6 feet long. However, according to the Animal Sport website, reports of bull snakes growing over 8 feet long exist. The snake's skin is covered in keels, making him more rigid than a smooth-skinned snake. The male gopher snake is generally larger than the female. The gopher snake is found along the coast of western North America down to Central Mexico. It also inhabits British Columbia, according to Stanford University. The snake adapts easily and lives in areas where rodents and small animals they typically feed on live abundantly, such as plains, deserts, grasslands, swamps and agricultural areas like wheat or corn fields. They prefer to burrow and live underground. 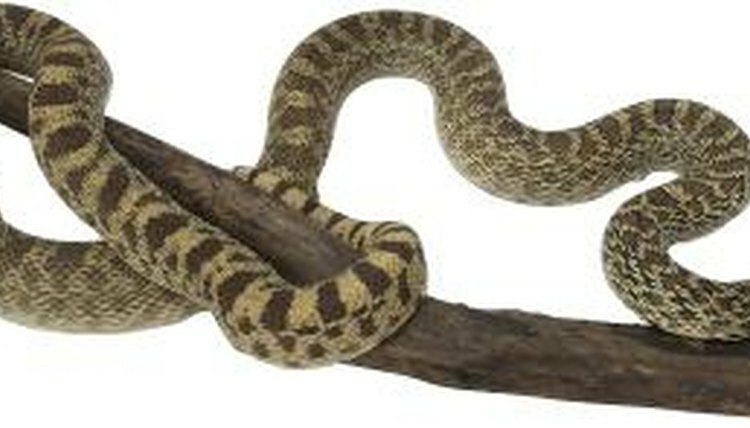 Commonly, snake collectors keep bull snakes as exotic pets. The bull or gopher snake is powerfully built but is generally a docile snake. When threatened, he makes a snorting sound that sounds like a bull's, thus his name. Like other snakes, the bull snake is cold-blooded and relies on his environment for warmth. The bull snake hibernates during the winter months and seek warm rocks and logs during the warm seasons.